Two convicts, one white man named John Jackson (Tony Curtis), and one black man named Noah Cullen (Sidney Poitier), are shackled together and go on the run after their prison transport vehicle crashes. Though they hate each other, they must find a way to work together if they are going to get away from the police, who are looking for them. 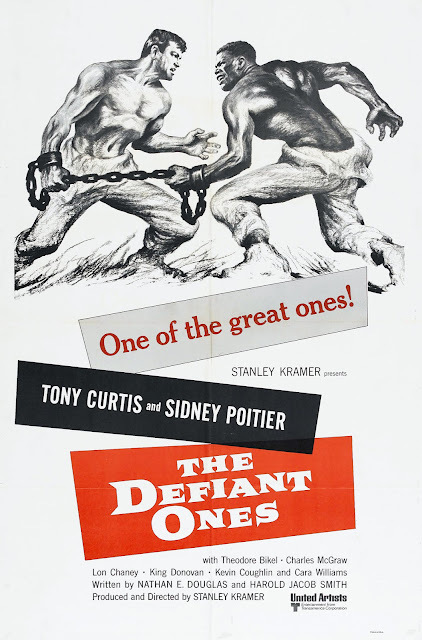 Nominated for nine Academy Awards, Stanley Kramer's "The Defiant Ones" is a simple 'cons on the run' film with a strong message about racism and civil rights. Two convicts, Noah Cullen, played by Sidney Poitier, and John 'Joker' Jackson, played by Tony Curtis, are chained together and make a run for it after their prison transport crashes. Joker is from the South and was raised with racist tendencies. Noah has been discriminated against all his life and has grown tired of the status quo of being a second class citizen. Needless to say, the two men don't get along. However, the two must come to an understanding if they are to avoid imminent capture. Both Curtis and Poitier earned Oscar nominations for their performances in this film. Sure, Curtis couldn't pass for a Southern man if he tried, his New York accent never far from the Southern drawl he attempts to exert, but it's hardly a critique in a movie such as this. It's always a pleasure to watch Poitier work, and this film is no exception. This being a drama, of course, the dialogue is going to be over the top here and there, but really, we didn't mind this at all as it only serves to aid the powerful overall story. We are sure "The Defiant Ones" held some very strong political influence in raising awareness during the civil rights movement being that it was released in 1958. Though sometimes these more political, poignant pieces of cinema lose their significance as the years pass, a film like this will always hold great historical value as a reminder of how this nation once was. It shows how far we have come as a country, and though we've gotten better, their is still a lot of room for improvement. We did enjoy this film for the most part. Curtis and Poitier work well together on screen as enemies turned allies. Their interactions are sometimes tense, sometimes dramatic, often exciting, and even occasionally funny. Really, this is not a plot driven film. It is mostly a study of these two characters and their personal arcs as they grow as people during their journey. Both are fully realized and very nuanced characters, each with flaws and attributes. Each obstacle they face only aids them in reaching a greater understanding of each other. Stanley Kramer did an excellent job of bringing this relatively simply story to life. "The Defiant Ones" is a solid piece of groundbreaking cinematic history that is absolutely worth a watch. One year ago, we were watching: "The Graduate"